A woman says she was saved by a faulty ATM. 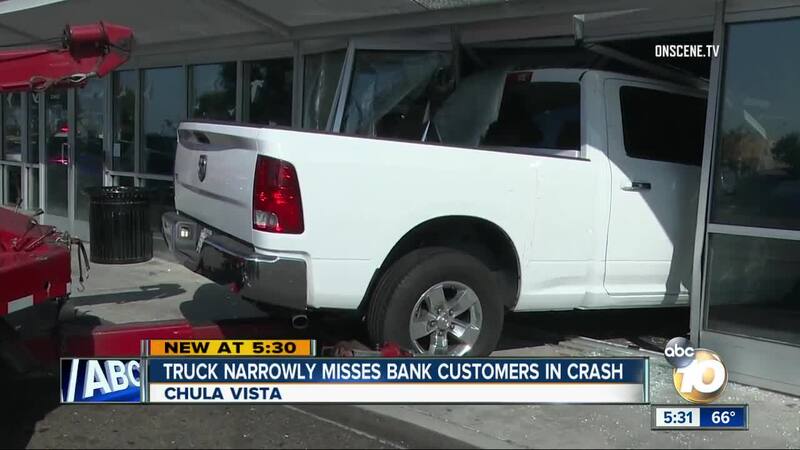 CHULA VISTA, Calif. (KGTV) - Customers narrowly avoided being hit by an out-of-control truck that struck a Chula Vista bank Tuesday, sending cash flying. Four people were using the ATMs in a vestibule at the Chase bank at 1120 Broadway about 12 p.m. when the Dodge Ram truck crashed through the glass entryway. Three customers dodged the truck, which came dangerously close to Anna Gonzalez. “I’m shaking; I have a big angel with me,” said Gonzalez. Gonzalez had tried to use an ATM but when it didn’t work, she moved to another machine. The first machine was the one hit by the pickup. Three other customers in the vestibule dodged the truck. Irene Archuleta was cut by glass from the vestibule’s shattered windows. An elderly man was injured and taken to the hospital, along with two bank employees who were in another room and thrown from their desks upon impact. There was no immediate word on the severity of the injuries. The driver, who was not identified, was not injured, according to Chula Vista Fire Captain Francisco Soto. Chula Vista Police are looking into the cause of the crash. Firefighters said the crash did not damage a load bearing wall, making it possible for them to remove debris and return cash to the bank.